Speech recognition technology is supercharging explosive growth and creation of new 21st-century digital communications opportunities for transcription careers. You know that court reporters are already using speech recognition, but what other forms of realtime reporting opportunities has this technology made available? Seeking a new career? Excited by the prospect of facilitating realtime global communications? Get in the know and join the future! 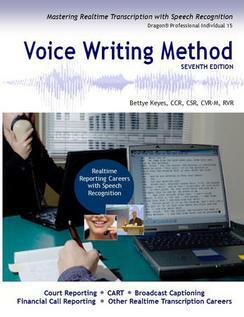 Learn how to master realtime transcription with speech recognition (Dragon Professional Individual 15). 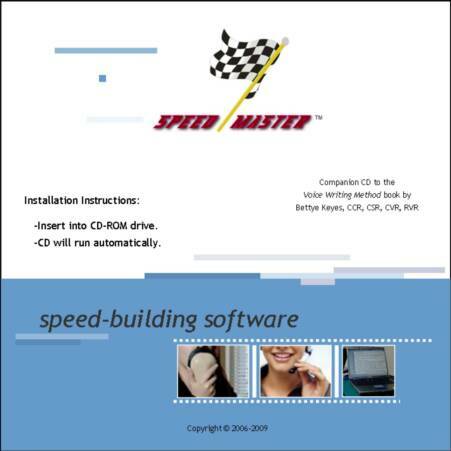 Accompanying this book on CD is SpeedMaster™ software, a speed-building program designed to help you rapidly build dictation speed as you work to increase speech recognition accuracy. SpeedMaster™ allows you to perform dictation sessions at your own comfortable pace—with unlimited practice material—and takes the guesswork out of measuring speed-building progress. SpeedMaster™ works only with plain text (.txt) files. When these files are opened through SpeedMaster™, text is displayed on the SpeedMaster™ screen. You can set the text-reading display to any speed you want, ranging from 100 to 350 words per minute, and dictate that text at your set word-per-minute rate. Text files of Dragon's general training stories are also provided with SpeedMaster™ so you can create a voice model at realtime dictation speeds.